As the Denver market continues to grow, one particular type of real estate seems to be popping up everywhere you turn: Coworking spaces. Designed for flexibility and ease of use for startups, freelancers and even established companies looking for interim or flexible workspace options, coworking spaces are attracting major attention and making headlines almost weekly. No longer just a fad, this type of office space is a force to be reckoned with. Right now, there are approximately 2 million square feet of coworking space in the Denver metro area. WeWork is currently the 2ndlargest private office userin downtown Denver with 432,150 square feet. 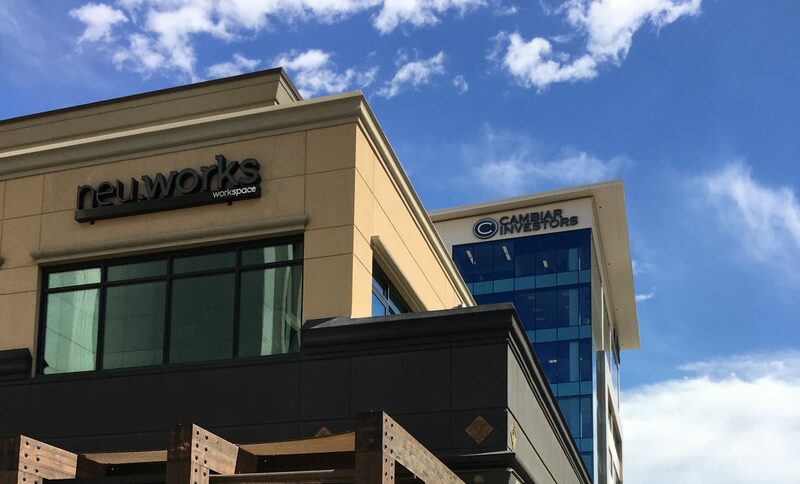 Last month, WeWork announced its fifth location in Denver, adding RiNo to a roster that already includes the Wells Fargo Center, Tabor Center, Triangle Building and LoHi. And if that doesn’t seem newsworthy to you, then consider that 7+ additional coworking spaces also opened their doors in Denver/Boulder recently, including Cultivated Synergy, Enterprise Coworking, Venture X, REth!nk, Rise Collaborative Workspace, Level Office and neu.works. With the popularity of these spaces – many of which have been around for a while, including popular spaces like Galvanize, Thrive and Shift – it might appear like a no-brainer option for you and your growing company. However, before signing on that dotted line, consider these pros and cons of coworking spaces. Undeniable Flexibility.Probably the biggest selling point of any coworking space is flexibility. Whether you need a single desk or an entire private office suite, coworking spaces offer a variety of options to meet your current and future business needs. They also offer short-term agreements or ‘memberships’ (some even month-to-month) that can be hard to find in traditional office space. If you need a quick fix for your office or are in a transition period, coworking could be your best bet. It’s also a great solution for companies with a national presence that might need ‘drop down’ space in multiple cities for traveling employees. Prime Location.Part of the big draw for companies to sign with coworking spaces is their location. While there are some to be found in suburbia, the majority of these spaces are located in the business and cultural centers of Denver. If you want to be in RiNo, for instance, but can’t afford a single-occupancy space, then coworking gives you an opportunity to take advantage of all the area has to offer without the burden of a massive price tag. Built-in Community.Coworking is built for people who aren’t afraid to rub elbows with their neighbors. Each coworking space creates its own ethos, attracting like-minded companies who often end up working together. Coworking spaces come with an innate culture of sharing, built around amenities like a having an on-site receptionist, centralized IT support, events and seminars, draft brews on tap, unlimited local coffee, office supplies, on-site gyms, and so on. This can provide an incredible opportunity for networking. Paying for (Potentially Unused) Amenities.While you might be able to secure the location and flexibility you want in a coworking space, it’s going to come at a price. Because coworking spaces operate with a membership model, you end up paying for multiple shared amenities (see above) that you wouldn’t necessarily pay for in a traditional lease. If you’re not using all of those services, you’re essentially leaving money on the table. Limited Branding Opportunities.While coworking spaces are usually among the first to implement new workplace design trends, the look and feel is pretty much one-size-fits-all. Designed to appeal to multiple businesses, there are often limited opportunities to reflect your company’s unique brand in your workspace. This is an important consideration as you think about how your company establishes its culture. Long-term Sustainability.While coworking spaces are extremely popular right now, it remains to be seen whether they can ride the inevitable ups and downs of the market. If overhead gets too tight, will businesses be willing to pay for these spaces if they can work from home or rent traditional space at a lesser rate? With national companies like WeWork, which has more than 14 million square feet of office space, admitting it owes approximately $18 million in rent, it begs the question of whether or not this model is sustainable. The good news is that these models make it relatively easy for you to get rid of your membership and seek other real estate options should the need arise. With all of that to consider, we recommend meeting with a professional broker who can help steer you in the right direction based on your current and future business goals. Your office space is an important piece of your business, and we’re here to help you make decisions that are right for your company. Want to learn more about how office space fits into your growth strategy? Read this blog post.